Egypt's Armed Forces Chief of Staff Mohamed Farid discussed boosting military and security cooperation with Cyprus during talks Tuesday with visiting chief of the Cypriot National Guard. 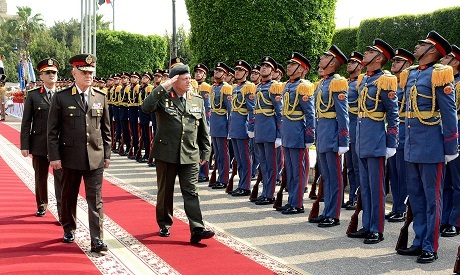 An official reception ceremony was held for Lieutenant General Elias Leontaris at the Egyptian Ministry of Defence in Cairo, with military music and the national anthems of the two countries played, Egypt's military said in a statement late Tuesday. The two officials discussed developments in the region and ways to bolster security and military cooperation between the armed forces of both countries. Leontaris was quoted in the statement as saying that he looks forward to increasing the number of joint military exercises with Egypt. The two countries, along with Greece, held a joint military drill in November 2018 on the Greek island of Crete that involved air and navy forces.